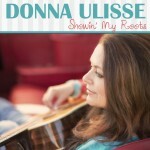 Donna Ulisse’s Showin’ My Roots is already being received well at radio. It maintained the #1 slot on the Airplay Direct Bluegrass/Folk chart for radio digital downloads for the whole month of October with over 900 downloads by radio. It also was #9 in the FolkDJ charts which is compiled from actual playlists of 129 DJs worldwide who report their playlists to the chart. It is also currently #10 in the EuroAmericana chart which is compiled from airplay by DJs in Europe playing Americana, bluegrass and roots music. SiriusXM’s Bluegrass Junction continues to add songs off the album into rotation.